For a 30-something female without kids I spent a surprising amount of time making dinosaur noises. Usually these are made to the dog just to see her confused little face but secretly I think it’s kinda fun. Knowing this you can see why a beer named Ryezilla was always going to appeal to me. Ryezilla brings together Mane Liquor, one of Perth’s greatest beer retailers, with the oldest brewery in Margaret River, Bootleg Brewery. Your Sherlock-like senses may have already determined the use of rye in this collaboration but it has another feature, showcasing new hop variety Enigma as its single hop. Enigma is one of the new hop-kids on the block, introduced by Hop Products Australia in July who describe their new addition as “cheeky” and “enchanting”. The result is a beer that’s assertive, fruit driven, bitter and kinda complicated. Ryezilla is an aggressive fruit salad of a beer, big tropical fruit and some citrus but it’s bitterness is punchy and the malt is kinda sweet, rounding out the fruity hops. She’s a big beer, she’s not for everyone and I reckon she was meant to be just as she is. In my search to find a suitable dinner pairing I decided to try something salty and something spicy. First up, some spicy oven baked chicken wings that whilst I didn’t marinate overnight still worked out pretty tasty. The spice was a bit on the mild side but had enough to stand up to the mighty Ryezilla. For something on the salty side I went with a broccolini and halloumi salad, though I am not sure that adding lemon juice and bread crumbs to this mix really constitutes the word ” salad “. The salty cheese was a nice contrast to the tropical hops and the cripsy breadcrumbs mixed into the “salad” seemed to go nicely with the beers crisp bitterness. If you haven’t tried the Ryezilla then I suggest you follow Mane Liquor on Twitter to see where you can catch it next, being a limited release I’m sure you’ll need to be quick! Otherwise there is also WA Beer Week coming up where Ryezilla will be making an appearance at the Best of the West – a Degustation with Mane Liquor & The Trustee Bar and Bistro on Tuesday 28 October. 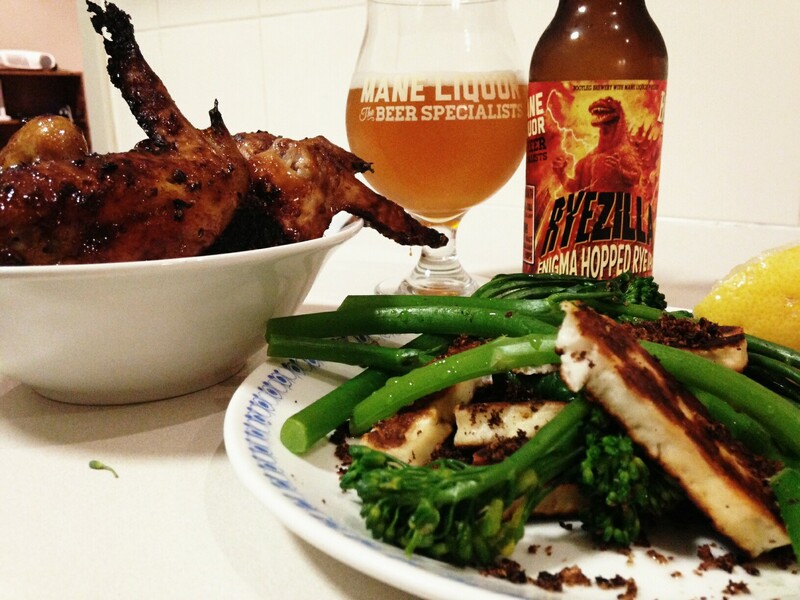 Ryezilla plus four other limited release WA beers will be matched to food from The Trustee kitchen. Tickets are $99 each and can be booked here. And I love local collaborations! Yup, hard to go wrong with wings! yup, hard to gone wrong with wings!